Robert and Tamre Shaw Reynolds passed away on January 10th and 19th, 2019. Bob and Tammy were long-time members of the First Baptist Church of Lewes, DE. They enjoyed bowling, traveling, and spending time with family, especially at crab feasts and holidays. 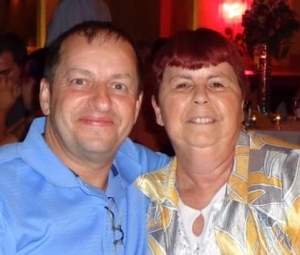 Bob worked for Securitas Services and Tammy worked for QVC as a jewelry inspector before becoming a home maker, who cared for her sick mother for many years. Bob was predeceased by his parents, Greg & Debbie Reynolds. Tammy is predeceased by her father, Reginald Shaw; mother, Jessie Strain and step-father, Joseph Strain; brothers, Bobbie, Richard, and Wayne Shaw. Bob is survived by his son, Robert Reynolds, Jr.; nieces & nephews, Lisa, Ashley, Scottie, Greg, and Jasmine. Tammy is survived by her brothers, Reginald Shaw (Edna), Leon Shaw (Cindy), Kevin Shaw, and Steven Shaw; sister, Cathy McKinley; sister-in-law, Shirley, many nieces and nephews. A memorial service will be held on Monday, January 28th at 12pm at the Joseph A. Ward Funeral Home 1459 Market St. Linwood, PA. Friends and family are invited to call from 11am-12pm. Burial will be private. I am truly sorry to read of the passing of your loved ones, Robert and Tamre. They will both be missed immensely. Losing a loved one in death is never easy. So much so Our Heavenly Father invites you to “Draw close to God and he will draw close to you.” I sincerely invite your family to do so by means of prayer and he will surely sustain your family at this delicate time as well as the days ahead. Hmmmm, what’s to say, Tammy my beautiful, dear oldest sister, I loved you more then you ever knew, you had the kindest heart, and selfless with everything and everyone!!!! Truly a blessed spirit. And Bob a good hearted man, you were a go go gadget man, you could fix anything, 😉 Say hi to mom……. GOD BLESS YOU BOTH…TAMMY, MISS YOU TERRIBLY BUT YOUR WITH YOUR HUBBY AND PAIN FREE NOW.. YOU GAVE IT YOUR ALL THRU THIS FIGHT AND NOW YOU CAN REST IN PEACE.